Euroclad Facades has helped to achieve an interesting and unique finish for Archbishop McGrath Comprehensive School. Multi-coloured panels have been specified and installed to provide a stimulating façade for the new Catholic School. The LINEAR 5 rainscreen system was chosen for its speed of installation, the high levels of product quality and Euroclad’s leading manufacturing capabilities. The new school believes in a truly balanced education where each pupil is not only given a choice of intellectual, cultural and scientific values, but is also presented with an array of values that are actually lived. The fundamental task of the school is to achieve a synthesis of culture and faith in life. The modern façade conveys a progressive but reliable vision, designed to support the ethos of the school. With colours, lines and curves that perfectly complement each other the new David Lloyd Club in Farnham provides you with the motivation to be your best even before entering the building. This inspiration is helped in no small part by the metal envelope that we manufactured. 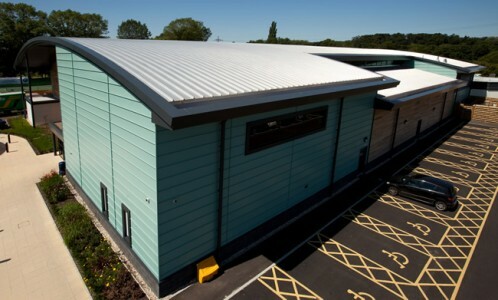 Our curved aluminium standing seam roof, weathered copper Vieo walls and precisely manufactured and installed perimeter fabrications come together perfectly to realise this impressive new building. The newest addition to the David Lloyd chain offers the broad range of facilities we have come to expect in these high-quality clubs: Various indoor and outdoor racquet sports, wellness and beauty area, several indoor and outdoor swimming pools and fitness and dance. The restaurant, meeting rooms, lounge, crèche and family room completes the package and makes David Lloyd Clubs what they are: genuine family clubs. In addition to all of these facilities David Lloyd Leisure created the group’s largest Amida Spa at this location. 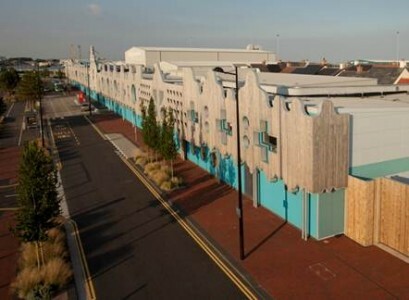 Construction finished on the new £25m BBC studio at Roath Basin in Cardiff Bay and Euroclad has supplied the entire roof for this prestigious development. Casualty and Doctor Who are two of the flagship TV shows that are being filmed at the new facilities. Elite Systems were chosen for their defined performance and system guarantee with Elite System 3, featuring the secret fix roof profile, helping acoustic engineers achieve the demanding acoustic specification. The project, designed by FAT Architecture and Holder Mathias, provides a drama production village for the broadcaster. The complex is the first industrial building in the UK to be given a Breeam outstanding certificate for its green credentials, the highest possible environmental rating.